Islam Around Us: Netanyahu: Israel is ready for every possible scenario on Syria. Netanyahu: Israel is ready for every possible scenario on Syria. Al Arabia | 01 Sep 2013 :: Israeli premier Benjamin Netanyahu said on Sunday that his country was prepared for “every possible scenario” that could happen in adjacent Syria after U.S President Barack Obama delayed military action. “Israel is calm and sure of itself, the citizens of Israel know that we are prepared for every possible scenario,” he told ministers at a cabinet meeting, in remarks broadcast on public radio, according to Reuters. Although the White House is currently waiting for U.S. Congress to convene on Syria, Israel’s military is on high alert over a possible strike, Israel-based news site Ynet reported on Sunday. U.S. President Barack Obama has chosen to seek congressional approval for military action on Syria. 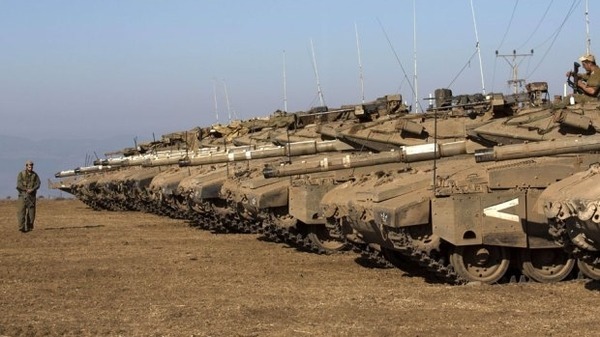 The Israel Defense Forces’ (IDF) Northern Command and Air Force is currently on high alert, with the Iron Dome and Patriot missile systems expected to be positioned in the country’s north and central areas. Israeli political sources quoted by Ynet noted that waiting for Congress to convene on Syria will mean that the U.S. will not attack Syria until at least ten days. Congress does not return from recess until September 9. “Obama is determined to take action, and as far as Israel is concerned when an attack is launched is meaningless,” said a source quoted by the website. By seeking approval from Congress, Obama now risks the same fate as British Prime Minister David Cameron, who was defeated on Friday when he lost his motion in support of military action on Syria.